After a busy week around the NBA and certainly in Los Angeles, the trade deadline concluded on Thursday at 3 p.m. Eastern, hours before the Lakers rallied from 18 down at the TD Garden in Boston to claim a 129-128 victory at the buzzer when Rajon Rondo buried an elbow jumper. The net additions for the Lakers were Reggie Bullock – our Joey Ramirez detailed his unique shooting skillset – and Mike Muscala plus a still-open roster spot. Ivica Zubac and Michael Beasley went to the Clippers in exchange for Muscala, while Svi Mykhailiuk and a future second round pick went to the Detroit for Bullock. Sitting at 28-27, 1.5 games out of 8th and 3 games out of 6th place in the West, the Lakers rank 27th in 3-point percentage (33.9%) and 20th in 3’s made per game (10.3), numbers boosted a tick after setting a franchise record with 22 makes against the Celtics. Pelinka explained that L.A. have been forced to contend with the Lakers “engines of the vehicle being sidelined,” as LeBron James missed 17 games with his strained groin, Rondo had two hand surgeries, and Lonzo Ball suffered the sprained ankle that has him out for at least a few more weeks. “With the periods of those guys being out, it became more and more evident that floor spacing was a big need for us to be effective,” Pelinka said. Bullock ranks 12th in the NBA in 3’s made this season (2.6 per game), in the 93rd percentile as a scorer off screens, fourth in the NBA in points off catch-and-shoot 3’s (6.9)*, and shot 44.5 percent from three last season. *The Lakers rank last in the league in catch-and-shoot percentage (33.1 percent). Meanwhile, it wasn’t easy to trade the 21-year-old Zubac, who had been developing steadily in house. Muscala is a career 36.5 percent shooter, who was playing 22.1 minutes per game off Philly’s bench, attempting 4.2 threes per night. Tyson Chandler, JaVale McGee and Zubac combined to attempt nine total threes all season (eight from McGee). Last offseason, Pelinka and Magic Johnson shared that they wanted to build an identity of playmakers around LeBron. Pelinka said he doesn’t think adding shooters over the deadline is a departure from the original plan. “I don’t think there was a shift at all – our identity is still playmakers, if you look at the core center of the roster with LeBron, Rondo, B.I. and Lance Stephenson and Kuzma,” he said. “I think probably what the journey held is once we started having injuries at the playmaking positions, the game slows down. We can’t play quite at the same pace. In other words, when the game slows down, spacing becomes more important. Pelinka sees the additional shooting as an option, a tweak, or a response to injuries but not a core shift in how the team wants to play. Pelinka acknowledged that the trade deadline period isn’t easy, and used an anecdote about a couple staying together on a train when an onrush of passengers entered the car, as opposed to splintering in two directions, to describe it. Several of the Lakers players have been getting the expected questions throughout the past week and change about trade rumors and the like, which is something that every team deals with, even if all situations aren’t created equally. He’s aware of all the challenges that Walton’s had to deal with this season, from injuries, young players, guys on expiring contracts and the deadline, and said he’s been impressed. The two spend a lot of time discussing the team. Most of Walton’s roster is solidified. LeBron and Rondo are back from injury, leaving Ball as the only unavailable player – it’s been 3 weeks since Ball was diagnosed with a Grade 3 ankle sprain, and given a 4-to-6 week timeline, though Josh Hart continues to deal with knee tendinitis. Bullock adds even more wing depth alongside Hart and KCP off the bench, while Muscala is now the lone stretch five on the roster. That does leave one open roster spot, however, which was part of the purpose of the trade with the Clippers. 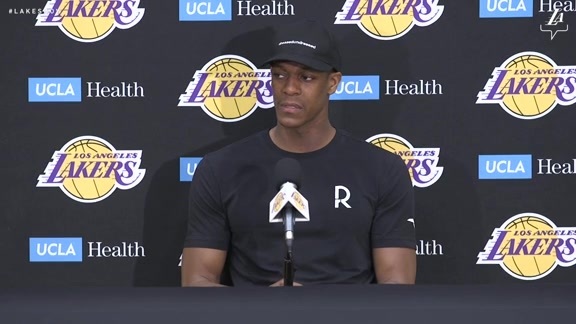 “We are evaluating a handful of guys to fill that,” said Pelinka. “We can choose to use it right away or we can choose to see if an unexpected injury pops up down the road that might change the way we evaluate, but it does give us flexibility to address a need. And I’m not sure whether we will do that really, really fast or whether we’ll be patient. Bullock and Muscala are expected to be available for L.A.’s next game, at Philadelphia on Sunday, before Tuesday’s game at Atlanta concludes a 6th straight game on the road in advance of the All-Star game.